It’s a sad thing, seeing your server die. I’m not saying it’s an official death sentence for my home server of almost four years now, of course, but I have the feeling it’s coming close. I took a hiatus for about a month in an attempt to try to straighten things out for myself and explore a few other games. When I came back, I was saddened to discover that the usual chat channels, once full of life and happy conversation, were dead. In fact, most of the time, it seemed like I was the only person in them. To say it broke my heart was an understatement. I love Thorium Brotherhood. It’s where I met a wonderful group of people, people I’m proud to call my friends to this day. Unfortunately, it seems as though most of my friends have moved on to other games. The majority of my friends list haven’t logged on in months, and while I still love my characters, I’m slowly realizing that I don’t think Thorium Brotherhood might ever be server that I knew again. As a result, I’m server shopping once again. I haven’t done this in years, and it’s a little scary. As a roleplayer, I’m really only looking at RP server, maybe even RP-PvP. I know the “standards”, of course. Moon Guard and Wyrmrest Accord are certainly viable options, and the servers I see lots of people recommending, but at the same time, I’m a little worried about this. For one thing, I left Moon Guard to escape some particularly bizarre drama after I left my old guild. For another, Wyrmrest is where a couple of the dramamongers went to. If I went to WrA, would I run into them again? Would they even remember me? Also, I’m in Eastern Standard Time. Would going to a Pacific-based server throw me off too much? WrA does have a few points in it’s favor, however, as a few of my friends have gone there. If not either of them, though, where do I go? What do I do? Do I just abandon the thought of RP entirely? The thought of that kills me, to be perfectly honest. So, fellow Warcraft players, help me out. Any recommendations? ALERT! ALERT! 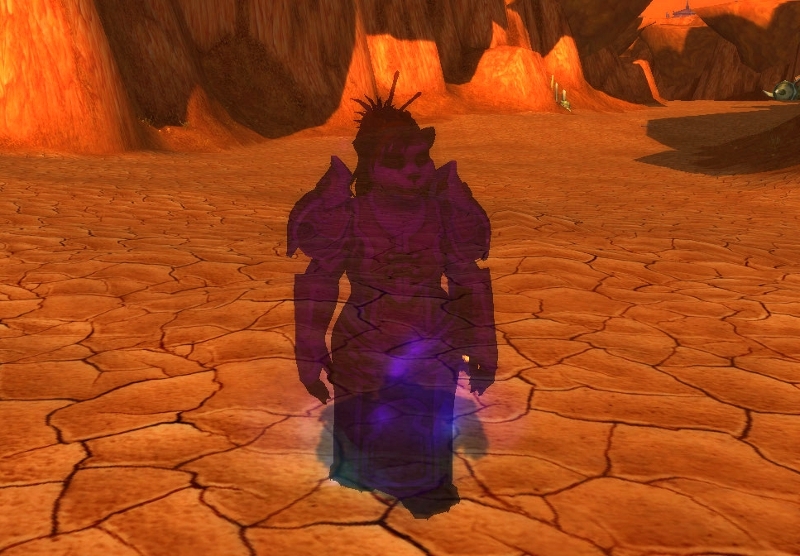 The following post contains spoilers for the Horde version of the Theramore’s Fall (level 85) scenario. If you have not completed this scenario, you should not read any further. You have been warned. So quite a few of you, dear readers, follow me on Twitter. As such, most of you have been subjected to my ongoing tweets about messing around with Alliance-side RP. See, the majority of the people I know on my home server of Thorium Brotherhood have been taking a bit of a break due to various reasons. While I hope that things pick up come Mists of Pandaria next month, I did miss RPing with people, and with my druid almost at 85 and my other characters on standby until Mists drops, I figured it couldn’t hurt to try something new. After all, none of my Alliance characters have ever lasted very long. When I mentioned this on Twitter, Bricu of WTT: [RP] naturally suggested Feathermoon. I do follow a good number of Feathermoon people on twitter, and they all seemed ridiculously awesome. I figured that if I was going to try this anywhere, it should be on a server that I knew had awesome people. I was even told there was RP happening Tuesday night! I had a bit of personal drama regarding what character I was going to roll (the race remained consistent, but the class changed several times), and, unfortunately, twitter got the brunt of it. (I do apologize for that, guys.) Ultimately, I went back to a dwarf priest, one I spent all of Tuesday leveling like mad so she could at least look decent for when she made her appearance. 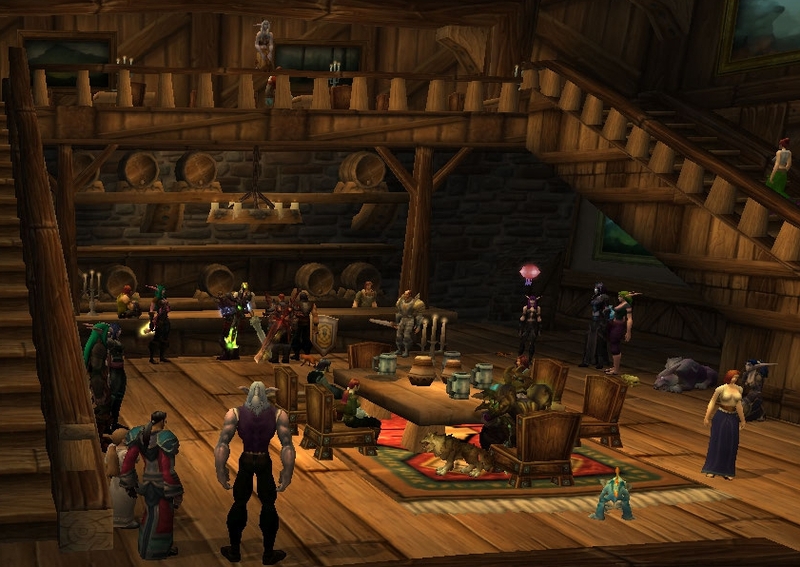 Finally, six p.m. server time rolled around, and I made my way to the Pig and Whistle in Old Town of Stormwind. I was all excited on the way there, and a little bit nervous, but it wasn’t until I got to the door of the inn that I realized something. I was completely and utterly terrified. I could see Tarquin and Threnn and even Aelflaed (whose blog, Too Many Annas, I also follow) already inside, and these are people I’ve spent at least two years reading about through various blog posts. And then I saw Bricu himself walk in, and I panicked. I couldn’t even get my little dwarf through the door! Yeah, suffice to say that I was incredibly starstruck already. Eventually, I decided I just had to get in there, similar to ripping off a bandaid, so I just ran inside and hid upstairs for a few minutes before sneaking downstairs and hiding at the table under one of the staircases. Bricu, however, saw me, and he was nice enough to provide me with a way into the conversation. Everyone was wonderful, and even though I may have botched the dwarf accent horribly, I really did have a lot of fun. I didn’t say much, no, and I spent a good chunk of the time thinking it would probably be easier if the character was a hunter or some other class (and I did have to admit that a priest drinking seemed a little odd to me), but I still had a great time. So much fun, in fact, that I’ll probably be back next week, if the Feathermoon crew will have me. Today, ladies and gentlemen of the internet, I would like to tell you a story. This happened after I had rolled a little dwarf hunter on the Feathermoon server in World of Warcraft. Why I rolled this dwarf is a story for another time, unfortunately. What is important to today’s story, however, is that Feathermoon is a roleplaying server. Like many (if not all) of the roleplaying servers out there, Feathermoon has it’s share of people who have rolled on the server, but have no desire whatsoever to roleplay. I could see the majority of them in trade chat while I ran my little dwarf around Ironforge, loading things up onto the Auction House and training some new abilities. And, as is bound to happen, many of the people going on in trade chat had characters with names that violated the naming policy (as well as the roleplaying policies that Blizzard has in place specifically for roleplaying servers, but that’s neither here nor there). However, in the course of my running around and trying to ignore trade chat, someone spoke up with something that wasn’t the usual trade chat fare. Now, you guys have to understand that I have absolutely no problem whatsoever with non-roleplayers who roll a character on an RP server. After all, I’ve convinced a friend who doesn’t roleplay to come join me on a roleplaying server before. However, when it comes to those who do not roleplay, I just have one main rule: respect me and I’ll respect you. Yes, this means do not troll the RPers, and not just because it will “mess up a little storyline”. You chose to roll a character on a roleplaying server. That means that many of us are there for the roleplaying. Believe me, we would all really appreciate it if you did not troll us. So when this person who was very much a non-RPer begged those in trade chat not to troll the roleplayers, well, it warmed my little heart. I’m not just saying, either. Their name might not have been the sort of name one might expect to see on a roleplaying server, no, but that one individual understood the concept of respecting the environment in which you rolled your character. They did not troll. They simply observered, and then asked other people to be respectful of the roleplayers. Needless to say, this made my night, and it pleased me so much that I had to share it with everyone else. I wish I could remember the name of this individual and I wish I had thought to send him a whisper thanking him for being respectful, but I am ashamed to admit that it didn’t occur to me until after I had logged off for the night. Instead, I say to all you respectful non-roleplayers out there? Thank you all so much. It really means a lot to me, especially after seeing how hard people can troll the roleplayers of Azeroth. 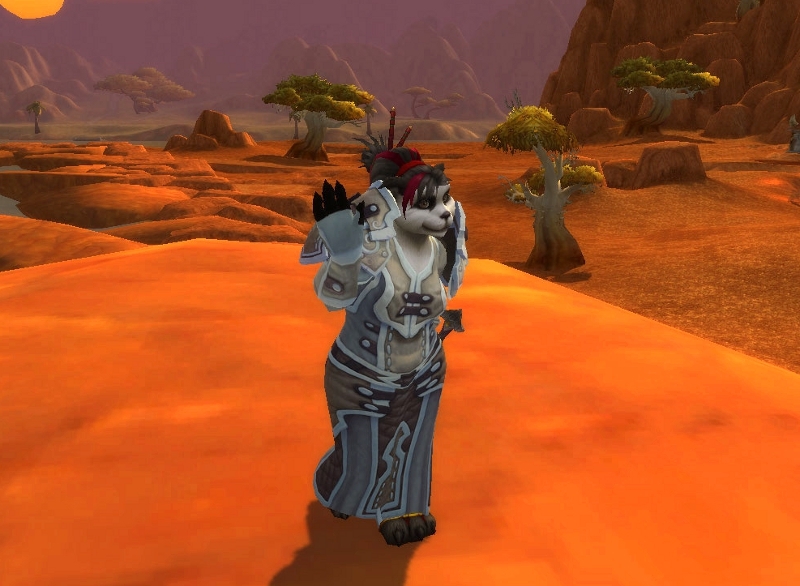 Everyone, meet Thyanel’s beta panda shadow priest, Hahani! Say hello, Hahani! Unfortunately, despite her happy-looking face, Hahani is incredibly disappointed with me. 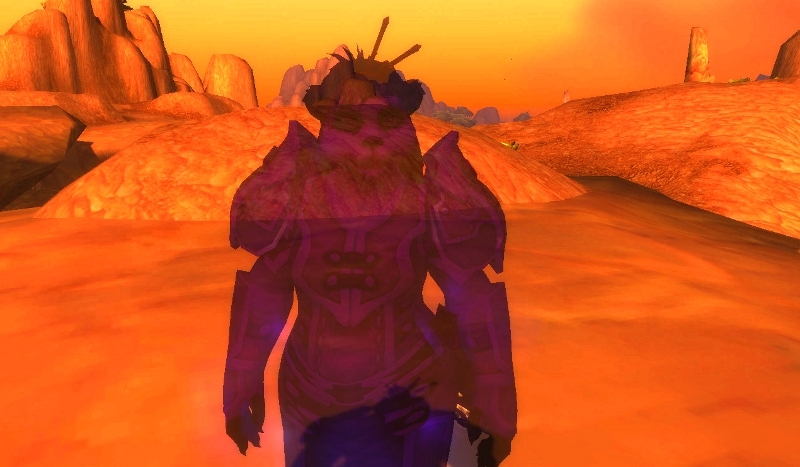 Well, thanks to a comment left on my previous post regarding the Mists of Pandaria beta, I realized I had been incredibly remiss in my shadow priestly duties. 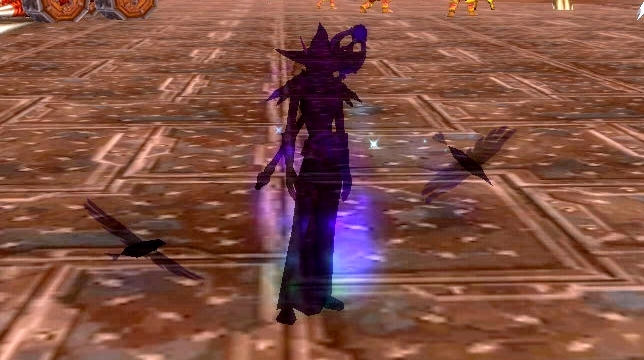 Pictures of the adorable pandas are all well and good, but how do the priests look in Shadowform? 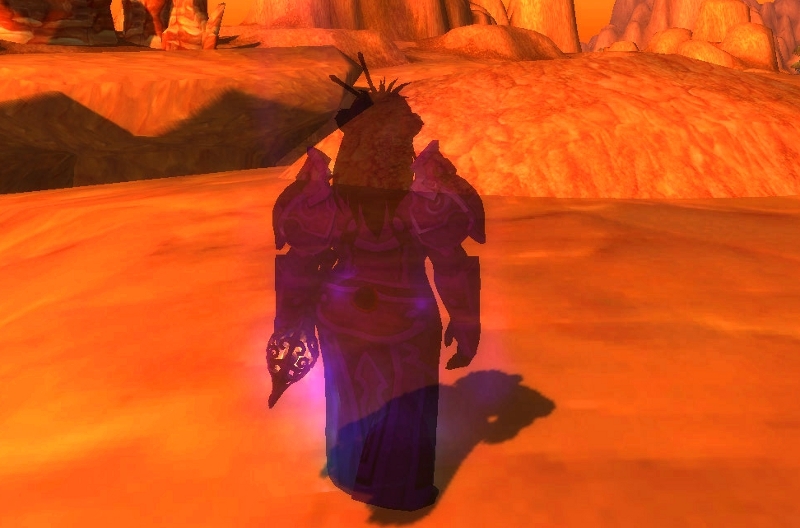 As a shadow priest, you spend the majority of your time in Shadowform. It’s not enough to like how you look outside of it; you have to like what you see in all your shadowy glory, too! So, Marc? This is for you.